Fun chaos is something to be expected when attending music festivals or live events. People constantly move around from one stage to another to catch their favorite performances which is not an ideal situation for holding on to their belongings especially a wallet or cash! The entire live event industry has been headed in the cashless direction, providing a solution to improve the guest experience. In the past few years, the radio frequency identification (RFID) system gains its popularity across US, Europe, and Southeast Asia market. The concept of cashless event intended to present better fans experience. Inside the venue, guests pay for their refreshments and merchandise using their wristbands. They do not need to carry around cash. Thus, minimizing the risk of getting pickpocketed, a common bad experience when people attend a music festival. The RFID system has become popular among event organizers. The colorful wristbands with RFID chips have said to quicken the wait time of queue lines and theoretically cater to more festival goers. That is to be said that cash is old school. 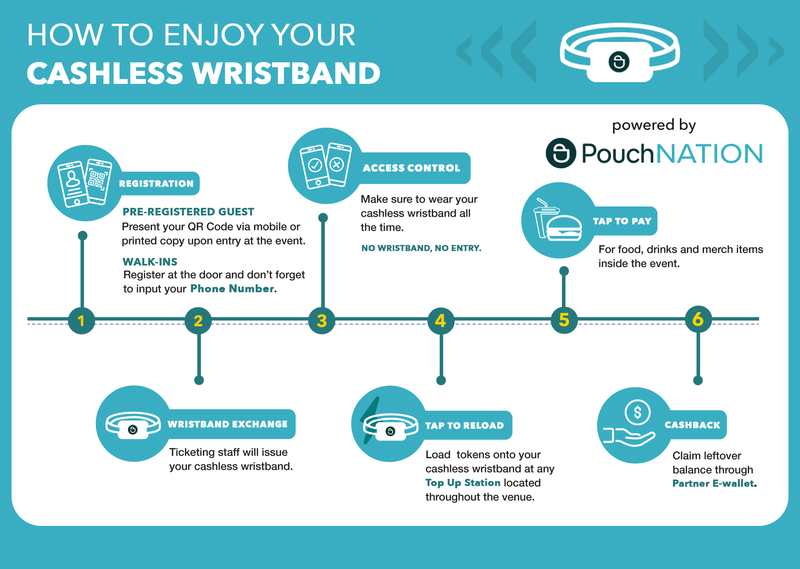 PouchNATION wristbands offer solutions for safety and efficiency making it the new necessity for event management. PouchNATION understands event woes faced by the guest. Offering its NFC (near field communication) wristbands which provide solutions for event pain points: Security, theft, fraud and even looking miles ahead for an overall improved experience for event organizers and guests. The system offered by PouchNATION allows much better fan experiences without depending on telecommunications service providers. The cashless event era is where the guest can get the best out of their time at an event which made possible by PouchNATION’s advanced online and offline infrastructure.